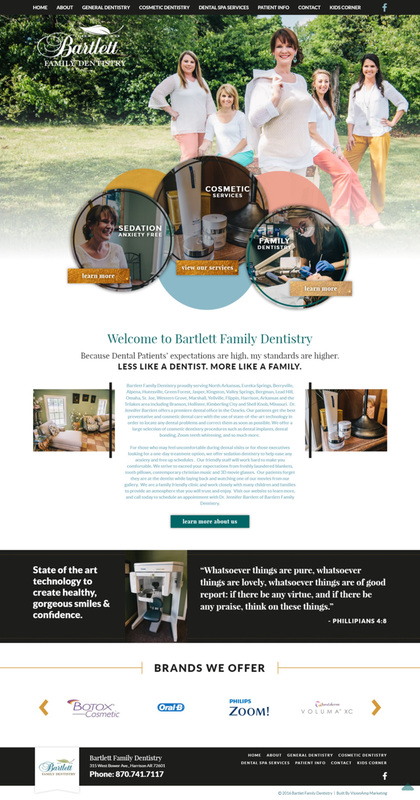 Bartlett Family Dentistry needed a website that reflected the unique style and customer experience of the office, dentist and atmosphere at Bartlett Family Dentistry. They specialize in cosmetic dentistry, and showcasing this was a priority to the client. We worked closely with the client, and did custom photography, to give the website the look Dr. Bartlett wanted to convey. The site is also fully reponsive and mobile friendly, and easy for the client to update. Dr. Jennifer Bartlett's dental office, Bartlett Family Dentistry, is located in Harrison, Arkansas. Patients receive the best preventative and cosmetic dental care with the use of state-of-the-art technology in order to locate any dental problems and correct them as soon as possible. They also offer a large selection of cosmetic dentistry procedures such as dental implants, dental bonding, Zoom teeth whitening, and more.